Adventure Time’s magical Land of Ooo is full of delicious looking food, only some of which is also a living being. Bacon pancakes, sentient sandwiches, Yeeargh!—there’s no end to the weird foodstuffs available to Finn the Human and his various friends. Now you can whip up your own version of stuff like the Everything Burrito—presumably without the spatulas or chopsticks shoved inside—with the recently announced Adventure Time cookbook. Written by culinary expert Jordan Grosser and Adventure Time comic book author Christopher Hastings, the book purports to be a partially disintegrated cookbook found by Finn and Jake, and filled in with their best guesses for normal human foods. 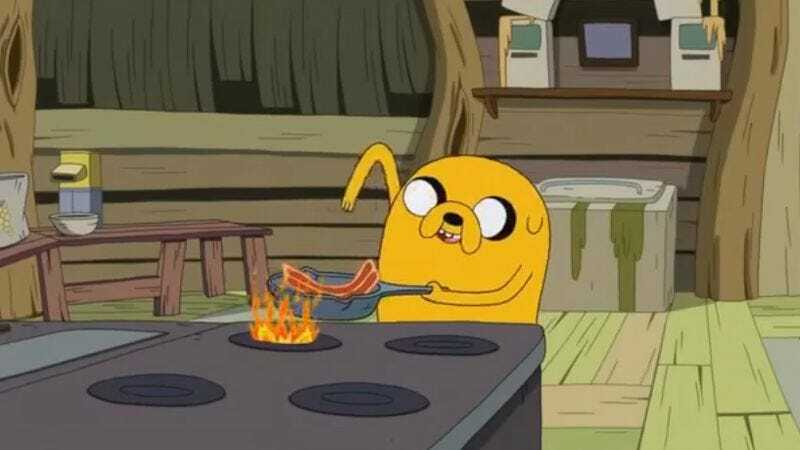 That means, in addition to the more fantastical stuff, it also contains a number of Earth staples like spaghetti and meatballs and grilled cheese, spiced up with an Adventure Time twist. Just be careful making Marceline’s Fries around your dad; if he steals them, it might lead to a rift from which your relationship will never recover.